Minds and bodies are growing quickly, give them the best. We farm in order to participate in the task of improving society and the environment for the next generation which is why we are so excited to offer nutrient dense veggies to preschools for their lunch and snack programs. It is our experience that when kids eat fresh nutritious veggies they like eating vegetables. Kids are eating twice the amount of carrots at preschools we have sold to when they come from the farm. More eaters than a family, with less experienced taste buds. Preschools have different needs for produce than do families. More of the staples like carrots, beets, lettuce, cucumbers, and potatoes will be the majority of the box. More adventurous flavors will debut throughout the season in smaller amounts to keep it interesting and diverse. This mix of regular staples with a few extras mixed in will allow kids to experience new, fresh flavors without it being a major component of the meals. And of course, preschools can still buy a CSA share if that matches their needs better. ​More volume of the staples: unlike a CSA with smaller amounts of 10 different varieties each week, a WSA contains 4-5 varieties of seasonal staples but more volume. With 10 lbs of Carrots, 5 heads of lettuce, 5 lbs of cucumbers, and 5 lbs of summer squash (as an example) a WSA box is enough produce for several meals for many small eaters. Overall lots of value and more than twice the volume of produce than what is available in a CSA box every week. Weekly price: a WSA box is $50 for the same 18 week delivery cycle as a CSA (June 6 to October 3) for an upfront price of $950 or 4 payments of $250 at the beginning of each delivery month (June, July, August, September) for a total cost of $1000 for the season. Weekly value: the varieties that make up the WSA box are at wholesale farm prices. Much cheaper than farmers market retail prices and without the minimum order amounts required by a shipped wholesale account, out of range for preschools. Weekly quality: the WSA box is packed with freshly harvested, seasonal, and nutritionally dense local food. Like all vegetables from the farm, they are never sprayed, there are no synthetic pesticides or fertilizers used. Only the best for the next generation. Accessibility: The WSA box is delivered along with the CSA boxes each Wednesday to the Smiley Building (see the CSA Page for delivery info) in Durango. It is pre-packed and ready for pick-up in less time then it takes to find the PLU produce code at a grocery store self check-out. For Preschools that want to divide the share with other area preschools, they can pick up the box on alternating weeks. Healthy Community Food Systems Discount: While funds last HCFS is offering a 20% cost share for preschools that purchase a CSA or WSA. Combine the HCFS discount with the already great value offered by the WSA with the special offer below to families of preschools to save considerably on the cost of healthy and local food. Closing the loop on education and nutrition, families can help their preschool save money on the WSA season purchase. ​For every family that buys a home CSA, we will provide a $20 discount to their preschool's seasonal WSA cost up to a total discount of $100. When signing up for a CSA, write in the preschool your child attends in the "How did you hear about us field". More than food and nutrition, lets create a new sense of normal. 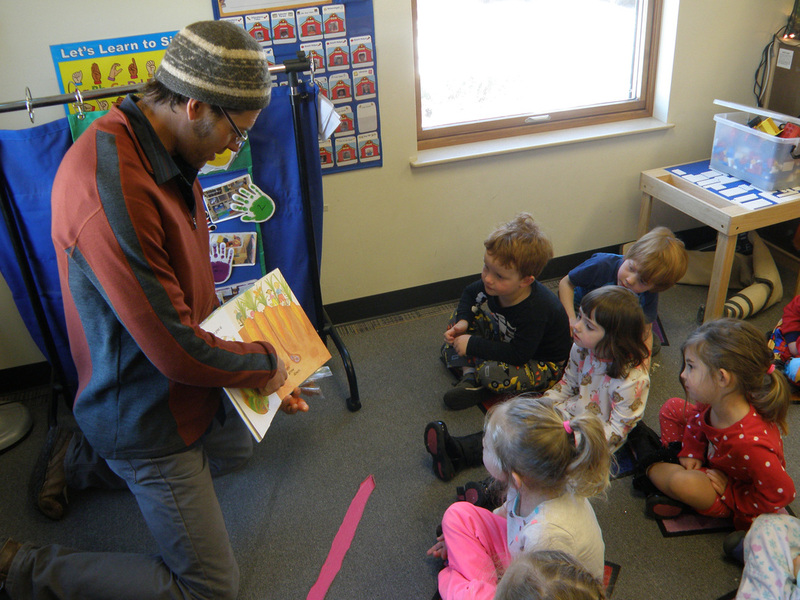 Preschool visits: the summer is a little busy, but during the winter a cameo appearance by 'Farmer Daniel' can close the loop on where food comes from. Visiting schools to share some winter stored carrots and stories about the farm is a joy, don't hesitate to ask. Farm visits: before the farm is put to bed, just before halloween, preschool families are encouraged to come see the farm, buy a pumpkin, and some winter storage crops while supplies last. Join the Facebook page and watch for updates. Toddler Yoga Classes: Not exactly farming but Hana is a part of the farm and also a kids yoga teacher. We like the idea of a world where kids learn the value of nutritious food and deep breathing for health and happiness from a young age.